Talking to a bat group member he reports a bat flying outside his home last night, not totally unusual for this time of time of year. What Was impressive was that his daughter Hazel heard it without a bat detector. The suggestion has been made that he drag her out to more bat group events. Her response was not recorded. 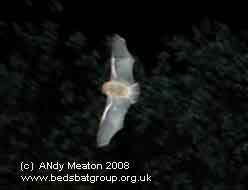 This entry was posted in Uncategorized and tagged flying bats, records. Bookmark the permalink.